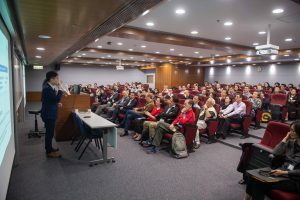 On 20 March 2019, the CUHK Fintech seminar : "Fintech: Something New Under the Sun?" gathered over 130 participants to explore what Fintech is and its implications to the financial services industry. Mr. Nelson Chow, Chief Fintech Officer of the HKMA, kicked-started the talk by discussing the evolution and emergence of technology in the world. Dynamic changes have been observed in the market, with a growing trend of technology involvement in businesses. He then shared his views about the future development of Fintech in Hong Kong. Nelson went on to explain the HKMA’s stance on Fintech. 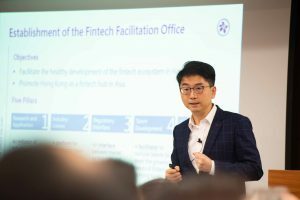 The HKMA adopts a risk-based and technology-neutral approach in its supervision and puts in great effort in striking a right balance between retaining appropriate flexibility for innovations and ensuring that customer interests are properly safeguarded during the course of fintech development. To enable this, the HKMA has launched a number of initiatives to promote Hong Kong as a Fintech hub in Asia. Two key initiatives are talent development and cross-border collaboration. Nelson believed nurturing talents to meet the growing needs of the Fintech industry in Hong Kong is the key to a sustainable fintech ecosystem. Hong Kong could also take advantage of the rapid fintech development in neighbouring regions. In today’s dynamic business environment, changes in banking operations are required to cater for the latest market needs. To bring new opportunities to the retail payment industry and promote greater convenience and experience to the public, the HKMA launched the Faster Payment System in September 2018 as a core part of Hong Kong's financial infrastructure. It has been well received by the public, as seen from the fact that the total number of registrations and transactions have surged to record high in the past few months. The HKMA will keep up the hard work in bringing the fintech initiatives from paper to reality, crafting a new era of Smart Banking. Fintech is a constantly evolving concept symbolized by different technologies at various points in time. In recent years, the accelerated growth of underlying technologies like artificial intelligence, blockchain, cloud computing and big data have spurred a range of new Fintech applications, raising questions on whether the "fourth industrial revolution" is approaching. Mr. Nelson Chow, Chief Fintech Officer from Hong Kong Monetary Authority (HKMA) will share with the audiences what Fintech is and its implications to the financial services industry. 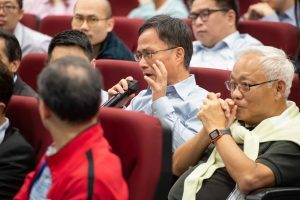 The seminar would also cover recent developments of Fintech in Hong Kong, as well as the role of the HKMA in facilitating Fintech development. Mr. Nelson Chow has been appointed as Chief Fintech Officer, Fintech Facilitation Office of HKMA since September 2016 with responsibilities for facilitating the healthy development of the Fintech ecosystem in Hong Kong and promoting Hong Kong as a Fintech hub in Asia. Mr. Chow joined the HKMA in 2004 and was responsible for the supervision of banks’ technology risk management and business continuity planning as well as the formulation of related policies and guidelines. He was the Deputy Chief Representative of the New York Office in 2010. After returning to Hong Kong in 2013, he took up responsibilities to supervise banks’ operational risk management and perform macro-prudential data analysis. Prior to joining the HKMA, Mr Chow was a Vice President of JPMorgan Chase Bank, N.A. responsible for information risk management of the Asia Pacific region. He holds a Bachelor of Science degree from the University of Auckland and a Master of Science degree from the Hong Kong University of Science and Technology.